Evaluation of potential benefit of launching/landing unhooked or not connected to the kite control bar. Of the 50 incidents described in the 2002 KSI volume roughly half MIGHT have been avoided by launching or landing unhooked or by not being physically connected to the kite control bar. Of the half or 24 incidents that MIGHT have been influenced by using “unhooked” techniques, 75% resulted in injuries ranging from minor to severe. 17% of this total resulted in fatalities that MIGHT have been avoided by using “unhooked” techniques. This accounts for almost half of all reported fatalities in the KSI for 2002. 25% of this total resulted in no reported injury. Many of these incidents may have been avoided by through improved techniques, training, use of careful judgment, advancing experience carefully and through other means. “Unhooked” technique is not intended to replace these necessary measures but potentially as a supplement to them. Launching and just as importantly, landing, unhooked or not connected to the kite control bar may impede the riding style of some kiteboarders. Others may adapt to the additional procedures more in stride. This practice will limit launching and landing overpowered reducing the wind range for a given kite. It might also compel riders to have a larger quiver of kites. It also complicates things and makes launching and landing less convenient. So why do it? As has been pointed out most riders don’t do it, today. Remember that this was a fairly common practice with two and three line kites not so long ago. It is suggested that the reader look over the incident, accident and fatality statistics listed above and think about it and decide about the value and need of discussing, refining, learning and promoting “unhooked” technique. There is no commonly accepted and promoted technique for launching four line kites at this time. Perhaps consideration and effort should be directed and developing and promoting such techniques to reduce the chances of dragging, lofting, incidents and accidents during launch and landing. Use of reliable, well maintained and tested quick release apparatus still appears to be indicated even if “unhooked” technique is used. In many cases kiteboarders have not been able to manually unhook. Use of a reliable mechanical linkage for releasing the bar at times other than launch and landing seems to be indicated. It is important the proper distances and launch conditions be observed by the kiteboarder to help insure that kite damage, incidents and particularly possible injury to others during kite depowering does not occur at any cost. It is also important the kite leashes be tested and be well maintained. This young sport is still evolving both in terms of techniques, equipment and hazard awareness and avoidance. Ideally someday there will be highly reliable automatic safety apparatus that will remove the need to consider launching and landing unhooked. That development appears to exist in the future and for now technique and judgment may have to serve in lieu of technology. This discussion has been assembled to promote dialog on and consideration of this issue, nothing more. It is up to the reader to make informed choices for himself based upon input from many sources not just this one. There currently is no popularly known and accepted statistical estimate of total kiteboarding hours, incidents and accidents worldwide. The KSI is not generally intended to serve as a database for statistical analysis but more for the formation and support on lessons to try to improve rider safety. Actual quantities of incidents and accidents are likely substantially higher than the quantities reflected in the KSI. So, this analysis would be more likely to suggest possible trends as opposed to actual global statistics. An experienced rider insisted on having an assisted launch in .overpowered conditions with a North 9 m kite in 30+ kt. winds. The assistant was reluctant to release the kite as "it didn't feel right." The assistant continued to hold the tip of the kite despite demands to launch from the kiteboarder and two bystanders. The assistant sent someone over to hold the kiteboarder's harness. The kite was then released and shot straight up and over into the powerzone. The tremendous force yanked the shackled bar out of the riders hands and pulled the trim strap through the bar and actually broke the bar. The kite then flew free from the rider who was uninjued. A bystander caught the whole thing on video. The kiteboarder had reversed the attachment of the lines to the left side of the kite. 1. 1. If riders launch in substantially overpowered conditions they should do so accepting that they could be more readily injured or even killed than under more normal conditions. 2. 2. All kiteboarders should carefully preflight their gear. Riders going out in winds 20 mph or greater would be well served to do 2 or 3 careful preflight checks. 3. 3. It is fortunate that this rider chose to have an assisted launch. Once again, a story about a rider in denial about the true risks and being excessively careless. The sad thing is that many riders can successfully follow highly marginal practices and get away with it much of the time, perhaps. These successes can build false confidence that may fail a rider someday. The rider's kitebar should not have broken under the load of this incident. If it had not it is likely that the rider could have been seriously injured or even killed. Even the person holding the riders harness could have sustained an injury. Good judgment is the best, most effective safety provision that we have. If we choose not to use it the consequences in the long term will often be serious and regrettable. It is unlikely that a rider could launch in winds approaching such over-powered conditions unhooked or unconnected to a chicken loop. As it happened in this case a controlled launch was beyond the ability of the kiteboarder in this case. If he had chosen to launch unhooked, the incident ideally would have terminated rapidly and safely. A kiteboarder was out in 18 kt. gusting to 25 kts. with a 12 m North Rhino four line inflatable kite. He was overpowered at time of launch but managed to control it. As he entered the water he lost his board. He was subsequently dragged downwind towards a wall. His girlfriend was waiting downwind of the rider with the intent of catching his kite. He was standing a couple of meters upwind of the wall when a gust lifted him and slammed him against the wall. He was subsequently dragged over the road and a distance of 60 m. By a newpaper account he was stated to have tried to disconnect from the chicken loop but could not. The rider was rushed to the hospital and after a short time he was declared as deceased from head injuries. The rider was hooked in and was not using a helmet. 1. 1. Pick your kite size carefully for both actual and predicted conditions. If wind starts to build it may be better to land it early as opposed to waiting for a more convenient location. 2. 2. Always use minimum safety gear including a good helmet, impact vest, quick release (QR) chicken loop attachment, a tested kite leash, hook knife(s), gloves and a whistle. 3. 4. Never place yourself upwind within 20 to preferably 60 m or more upwind of hard objects. Avoid placing yourself into such situations even if you must land your kite on the water. Better hazard awareness and safety technique would have likely avoided this fatality. Kites are so very powerful and things can deteriorate into a severe situation very rapidly. The best response is often an early one, well before things can continue to deteriorate. Wearing basic safety gear can compensate for some errors in judgment sometimes. Being upwind of a hard object in conditions like this is setting the table for a grim outcome with little recourse if things go wrong. It is possible that this fatality could have been averted if the rider had launched unhooked. A new kiteboarder rigged up with an unidentified kite in a very gusty onshore wind day. He had an assisted launch but reportedly too far off the wind into the power zone. As a consequence he was lofted about 6 ft. high and 20 ft. horizontally to impact into a parking lot railing. He suffered a broken femur on one leg and a broken ankle on the other. Neither the kiter or his helper had kiteboarding lessons and had previously only been out in light winds. 1. 1. Take adequate, professional kiteboarding lessons. 2. 2. Avoid onshore winds and particularly if you are a new kiteboarder. 3. 3. Always launch your kite at the correct position off the wind relative to the wind speed and kite size. That is if you are in the center of the power range for a given kite size launch at 90 degrees off the wind. If you are underpowered launch at bit further off the wind perhaps at 100 to 110 degrees. If you are near the upper limit of the power range for a kite, select a smaller kite or launch a bit less than 90 degrees off the wind. 4. 4. Always wear suitable safety equipment. 5. 5. Never launch upwind and close to (within a hundred feet and preferably further) hard objects. 6. 6. Always be ready to deal with the unexpected, particularly in higher winds. The violent power of kiteboarding kites should not be underestimated. The potential to injure and even kill particularly in the hands of poorly trained kiteboarders should not be ignored. If you see riders that appear to need some good advice please offer it in the most tactful, effective way that you can manage. It is possible that this accident could have been averted if the rider had launched unhooked. Several experienced riders were out when a squall started to move into the area. Violent squall related wind warnings had been previously sent out with the weather forecast. Dark squall clouds had been visible much of the day but further out to sea. Prior to the arrival of the squall, the wind was about 5 Bft. (17 to 21 kts.). A couple of riders saw the squall moving in and secured their kites on the beach rapidly. Another rider had lowered his 6 m X2 kite for an assisted landing and almost had it in the assistants hands. The wind suddenly gusted violently to approximately 9 bft. (41 to 47 kt.). The rider was lofted up to about 10 m (33 ft. ) off the beach and blew him at speed approximately 30 to 50 m (95 to 170 ft.). The kiteboarder hit the beach at this point but was lofted to about 5 m (18 ft.). The rider hit the beach again and the kite detached and flew away . A rider was seen flying over the beach with a 6 m X2 kite about 5 m (16 ft.), above the beach. Lifeguards responded immediately and rendered first aid. The rider was airlifted out by helicopter and his current condition is unknown. Within about ten minutes of the squall winds returned to normal. 1. 1. Kiteboarders must avoid squalls at all costs. 2. 2. Kiteboarders should always practice anti-lofting technique. 3. 3. Always use minimum safety gear including a good helmet, impact vest, quick release (QR) chicken loop attachment, a tested kite leash, hook knife(s), gloves and a whistle. 4. 4. Rehearse dealing with emergency situations both mentally and physically to reduce reaction and response time. An early high priority should be to activate your tested kite leash. 5. 5. Depower your kite sooner than later even if it is less convenient. Later, you may not have time. Many kiteboarders have been lofted in violent winds associated with squalls or storms around the world. The only effective way to manage gust lofting is avoidance as if you wait to the last minute or if the gust hit with little warning by the time you analyze the situation it may be too late to react to avoid injury. All kiteboarders should evaluate weather forecasts and real time winds and weather radar to evaluate for the presence of storms. If storms are in or are moving towards your area, don't go kiteboarding. More information on this may be found in the Kiteboarding Safety Resources (KSR). Unhooked technique applies to both launching and landing. That is at times when it is possible or even likely under certain conditions to be dragged or lofted into hard objects. If this rider had practiced unhooked landing it is possible that the accident could have been avoided. A very experienced rider had been kiteboarding earlier in the day well powered in relatively steady Force 5 (17 to 21 kts. ), onshore winds. It was high tide so the normally very wide beach was relatively narrow at about 12 m (40 ft.) ending at a seawall. He was going to have an assisted launch of his Airush 9.4 m four line LEI kite. He had chosen to launch rapidly, near the seawall area as opposed to further down the beach away from these downwind hard objects. During the assisted launch the rider yelled "NO" but the assistant thought he said "GO" and released the kite. What the assistant could not see but the rider had was that the lines on one side of the kite in strumming in the wind had tangled. The kite flew up at high speed and arced over into the center of the power zone out of control. The rider was dragged into the approximate 1.5 m (5 ft.), high seawall. At that point his was lofted and flown over the seawall, slamming into the top of a 4 inch diameter fiberglass flag pole at a height of about 5 m (16 ft.) and broke the pole with his body. He was then flown over some cars and into the side of a panel truck, badly denting the side of the vehicle. There was a six foot high brick wall immediately beyond the truck which the rider would have hit if not for the panel truck. The rider was connected to or hooked into his quick release chicken loop but didn't have time to detach prior to the first impact. He was not wearing a helmet or impact pfd. The overall horizontal distance of travel was estimated to be about 40 m (130 ft.). The rider was in severe pain, placed on oxygen and rushed to the hospital by ambulance. His injuries included a fractured pelvis and femur, rib and nicked cheek. Amazingly he did not suffer serious head injury. It has been reported that he should heal fully in time. could potentially avoid further launch related accidents caused through miscommunication. There other cases in the KSI of problems caused by misunderstandings during this critical phase of kiteboarding. 1. 2. Always be methodical and as slow as necessary in setup, preflighting and launching. Refer to the steps described in the Safe Kiteboarding Guidelines and other appropriate practices to try to improve your kiteboarding safety. 2. 3. Always walk a bit further away if a more appropriate launch area is present. One that lacks downwind hard objects, bystanders, vertical surfaces that may cause uplift and other potential hazards. 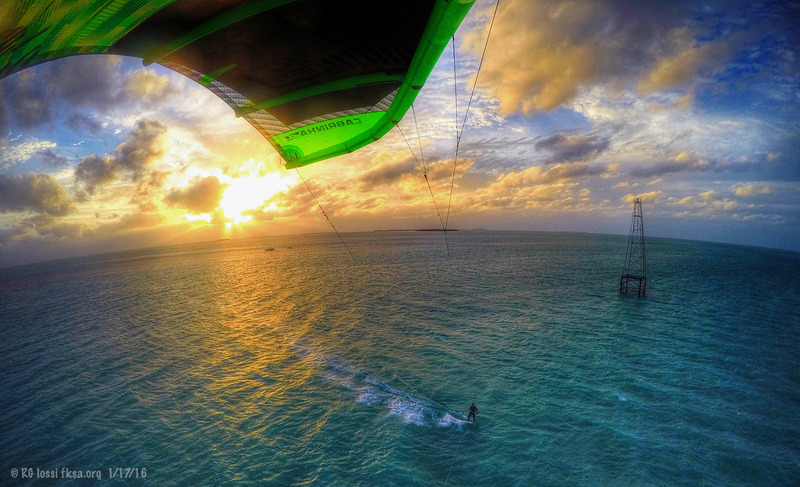 "Distance is your friend" in kiteboarding. Downwind hard objects are reportedly not a serious issue as a rule for most locations at this launch. 3. 4. If you decide to hook or snap shackle into your chicken loop or harness line, even with a quick release function, you should assume that someday you will be injured by this practice. I safer course of action is never to hook in or connect to your control bar during launch. 4. 5. Always wear safety gear including at a minimum a good helmet appropriate for kiteboarding, an impact pfd, hook knives, whistle and gloves. 5. 6. Be particularly cautious in onshore winds. Choosing not to launch in such winds may save you injury someday, regardless of your level of skill. This rider was reported the most experienced kiteboarder at this launch. This was another unfortunate, avoidable accident. If fortune had not be with this rider he could have very easily been killed, at several points in this accident. Probability dictates that we will have only so many narrow escapes along with other less fortunate accident outcomes. We really need to take the power and potential hazards of this sport in all seriousness. Review and follow the Safe Kiteboarding Guidelines and other appropriate practices. In many of these accidents it isn't one serious error in judgment that causes things to come to harm but several. Things like rushing to launch, launching upwind of hard objects, flying in onshore winds, launching hooked in, not wearing a helmet or impact pfd, not preflighting, not using agreed launch signal dialog, etc. We really need to approach this sport with more care otherwise every once in a while a rider will be injured. A new kiteboarder of about two months experience was preparing to launch his approximate 16 m, four line Naish kite. A storm was approaching and other kiteboarders had told him not to launch his kite in the imminent storm conditions. The new kiteboarder said he could handle things, ignored this advice and went back to setting up his kite. It was indicated that this new kiteboarder had shown over-confidence in his abilities in the past and was not receptive to advice. It was indicated that the kiteboarder was still working on getting up on his board. He was flying his kite while hooked into the chicken loop on the beach for about 5 to 6 minutes, apparently with the intent of body dragging in the water. Suddenly a storm gust hit, lofted the kiteboarder inland over an unspecified distance towards some town home dwellings along the shoreline. Following impact the man got up, apparently uninjured while still hooked in and walked towards the kite carrying his control bar. A second gust hit, estimated to be on the order of 35 to 40 kts. and carried the rider a short distance into a privacy wall around a town home. The kiteboarder was not wearing a helmet and died as a result of the impact. The over all horizontal distance of travel was estimated to be 10 m (33 ft.). 1. 1. Always take adequate kiteboarding lessons. The price of learning on your own may be too high. 2. 2. Always avoid unstable squally weather. Check weather predictions, real-time wind reports and color radar out in advance of your kiteboarding session. If excessive gusty or stormy weather is in the area or moving towards your area, don't go kiteboarding. While out kiteboarding always be aware of weather conditions and come in well in advance of serious wind speed, direction or temperature changes related to storms. If in doubt, come in. 3. 3. Never approach your kite while attached to your control bar unless an assistant is firmly holding your kite. If you must walk up to your kite under these conditions, grasp one line only and carefully walk towards the kite while maintaining tension on this one line only. 4. 4. Gloves are a good idea if this technique is used. It would be safest for the kiteboarder however not necessarily for bystanders to remove your kite leash after tensioning the one line but before walking towards the kite. 5. 5. Don't launch hooked in or attached to your bar, particularly if you are new to kiteboarding. Rehearse letting go of your bar to activate your leash. Test your leash in advance of trouble to improve the chances of it working properly (see link listed below). 6. 6. Never fly your kite onshore for extended periods. Launch it with the kite near the water, raise it high enough to clear obstacles (20 to 30 degrees of the land) and go offshore immediately. 7. 7. Always wear appropriate safety gear including at a minimum a well fitting, good quality helmet, an impact pfd, a hook knife(s), a whistle and gloves. 8. 8. Never allow over-confidence to put you into a critically vulnerable position. This will take some self-awareness and honesty, but the price of self-deception may be more than you wish to pay. 9. 9. Review the documents listed under Kiteboarding Resources for ideas on how to potentially kiteboard more safely. The documents and ideas have been prepared from analysis of actual kiteboarding incidents and accidents. This accident and fatality could easily have been avoided. It is important to note that this could happen to ANYONE under similar circumstances. Kites are extremely powerful under violent wind gust loading. It was readily predictable, trouble had been anticipated by other riders and good advice given to the new kiteboarder, which was ignored. The kiteboarder apparently trivialized the hazard or didn't bother to consider the logical consequences of his actions. Of course it is unlikely the other kiteboarders would have predicted this severe of an outcome. Kiteboarders that fly near storms should eventually expect violent, sudden winds and potentially serious consequences. Many kiteboarders have been injured to date and some have been killed by the effects of storms or squalls. The only reasonable solution is to use good judgment and knowledge to avoid circumstances such as these. New riders while still learning need to be particularly cautious. Experienced riders need to understand what is at risk and be prepared to be injured if they choose to kiteboard near such conditions. We really need to effectively spread the word about the hazards of unstable stormy weather. Too many riders do not view it as having any real significance. Perhaps cattle in the field show the same lack of concern to a pending lightening storm. We need to learn from these experiences and spread the lessons effectively to our fellow riders. This puts particular burdens on kiteboarding retailers, instructors, associations and the media. If we wish to avoid, avoidable accidents and occasional fatalities this communication needs to effectively occur. Additional information on storms and kiteboarding appears in the General References at the Internet location listed above. If launching unhooked had been conveyed to this inexperienced and not particularly receptive rider by accounts, it is possible that this fatality could have been avoided by unhooked launching technique. 9.4 m four line LEI in steady 18-22 MPH onshore winds. He had apparently been out recently with a CO2 7.2 m and was underpowered. He did not want to make that mistake on this day. The rider was launching in the chicken loop with his kite fully powered up. The launch layout compelled the assisted launch to occur with the kite more downwind or closer to the center of the wind window than at the side of the wind window, i.e. the rider is launched "hot." The assistant is uneasy about the launch circumstances but rationalized that if the rider depowered his kite fully and he should be able to run to grab the rider if he is dragged. The kite is released , the rider stumbles through two steps, falls and is immediately dragged across the ground fast, bouncing on his hips, legs and shoulders. The rider gets pulled thru muddy pond with his head underwater, then is slammed into rock embankment with sickening force. At this point, the kite stopped flying, which was unexpected under the circumstances but very fortunate. The assisting kiteboarder ran over, unbuckled his harness, discerned that he didn't have anything life threatening happening, and had a golfer call 911. Paramedics, fire truck and ambulance arrived quickly and rapidly transported the injured rider to the hospital. Reportedly the rider had been told by his instructor that the 9.4 m kite was too large for the conditions. The rider was not wearing a helmet or impact pfd. The kiteboarder was diagnosed with chipped bones in his ankle and knee, fractured wrist, and will required emergency hand surgery. Miraculously the rider had no head or spinal cord injuries. 1. 1. Launch in conditions and at a location within your ability and experience, with suitable equipment, in a safe manner. 2. 2. If you underestimate the power of your kite, gusting winds, or launch selection it can be easy to be injured. 1. 2. Refer to the steps described in the Safe Kiteboarding Guidelines and other appropriate practices to try to improve your kiteboarding safety. 2. 3. Always try to launch your kite from a portion of the wind window appropriate for the wind speed evident. That is if you are at the higher end of the wind range for a given kite, launch with the kite at about 70 to 80 degrees off the wind, if you are in the middle of the wind range, launch at around 90 degrees and if you are at the bottom end of the wind range for the kite consider launching at 90 to 120 degrees off the wind as appropriate. Your kite upon release should gradually rise under control and not pull the rider with undue pressure. 3. 4. One approach that is generally safer is to launch with your kite closer to the water than the rider. If you are dragged you should be dragged into the water as opposed to upland. Bring your kite up only about 15 to 25 degrees from the ground and immediately go offshore. DO NOT BRING YOUR KITE TO THE VERTICAL OR ZENITH WHILE ONSHORE OR NEAR HARD OBJECTS. 4. 5. If you decide to hook or snap shackle into your chicken loop or harness line, even with a quick release function, you should assume that someday you will be injured by this practice. I safer course of action is never to hook in or connect to your control bar during launch. 5. 6. Always wear safety gear including at a minimum a good helmet appropriate for kiteboarding, an impact pfd, hook knives, whistle and gloves. 6. 7. Be particularly cautious in onshore winds. Choosing not to launch in such winds may save you injury someday, regardless of your level of skill. This was another unfortunate, avoidable accident. If fortune had not been with this rider he could have very easily been killed, at several points in this accident. Probability dictates that we will have only so many narrow escapes along with other less fortunate accident outcomes. We really need to take the power and potential hazards of this sport in all seriousness. Review and follow the Safe Kiteboarding Guidelines and other appropriate practices. This type of accident has been repeated in the KSI. We really need to approach this sport with more care otherwise every once in a while a rider will be injured, sometimes severely. People often trivialize the risks of this sport or worse never even stop to consider them or to take adequate professional instruction. It is possible that this accident could have been averted if the rider had launched unhooked although this choice also may have compelled the rider to launch a smaller kite as well that could be managed manually during launch and landing. A rider was out in 17 to 27 kt. winds with an Airblast 4.9 m inflatable kite with rigged for the first time with at S-2 Lock in Bar. Upon launching the kite at the edge of the water on the beach, the rider noticed a twist in the lines that he thought he could cure by rotating the bar once the kite was airborne. Upon rotating the bar the shackle swivel locked resulting in the strap twisting in the fairlead or channel on the side of the bar. He then rotated the bar back into the original position with the lines still twisted. While all this was going on the rider was being dragged at high speed estimated to be around 30 mph. He pulled the chicken loop quick release snap shackle when he came within 50 m (170 ft.) of a seawall and some boulders. The QR snap shackle failed to open. The rider positioned his feet in front of him and hit the boulder at high speed on his backside. The QR opened upon impact with the boulder freeing his kite. The rider's screaming brought assistance and he was taken to the hospital for treatment. The kiteboarder estimates that he was dragged 150 m across the water. His injuries included a crush vertebra, fractured pelvis and a very sore, stitched rear. He was released from the hospital but confined to bed rest. He expects to resume kiteboarding after an approximate 3 month recuperation period. He was not wearing a helmet or impact pfd. The rider felt that there was no irregularity in how the lines were attached to the kite. 1. 1. Always carefully preflight your gear before launching. In higher winds doing 2 to 3 preflights would not be excessive. 2. 2. Never try out new gear, kites, bars or boards, in anything stronger than light to moderate winds. Small mistakes are often severely punished in well powered conditions. 3. 3. Always wear a good helmet, impact pfd and knife(s). The exact cause of this accident is unknown. Normally if the lines are attached to the correct locations on the kite and aren't tangled with each other or with foreign objects, proper kite control should be maintained. Normal, careful preflighting should catch such irregularities before you launch and are trying to deal with an out of control, very powerful kite and a potential very hard impact. Wearing basic safety gear may have made a difference in terms of the injuries suffered. Also an effective knife may have allowed the rider to cut himself free although being towed at high speed may have unduly complicated this effort. The KSI has more than one accident in which the first time use of new equipment in well powered conditions figured. Always try out new gear in light to moderate conditions. Also, always very carefully preflight your gear before going out and particularly in well powered conditions. Review the Safe Kiteboarding Guidelines for preflighting tips. An advanced intermediate rider was out on a North Rhino 12 m kite in 18 to 20 mph winds side offshore with high gusts to 25 mph and substantial lulls to 5 mph. The rider had come into the beach to land. He waited for about two minutes signaling for an assisted landing to the kiteboarders onshore. None responded to his request for aid in landing his kite. The rider was hit by a lull and then a strong gust. He was worried about being lofted on to the rocks that were just downwind. He popped his snap shackle release and reached for his grab leash while his lines were slack in the lull. He missed reaching the grab leash before the gust hit. He flew the kite away from shore and was hit by another gust that yanked the bar out of his hands. Once the rider lost his grip, the kite was turned into a fast moving runaway heading towards a bridge that is about a mile away downwind. Two observers noted the runaway kite and one started running full speed along a bike path in an attempt to intercept it. He was concerned about potential harm the kite might cause to bystanders, access to this launch and the kite itself. During the chase the observer was concerned about the kite launching up into the roadway on the bridge or into an adjoining roadway, in either case potentially causing an accident. The observer ran into the water near the bridge to intercept the kite. He was then hailed by the rider that lost the kite. The rider hitched a ride by car to the area of the bridge from another kiteboarder and had just arrived. Between the two of them they managed to depower, secure the kite and bring it ashore. **NOTE: A grab leash is a loop or handle that is intended to manually held on to depower the kite. It hangs from one end of the bar and is connected through a hole to one bridle line. Alternatively, the grab loop or handle may attached to a fixed leash as opposed to a slide through design leash. Conventional leashes are attached to the kiteboarder and intended to activate automatically when the bar is released. Grab handles rely upon the kiteboarder keeping a grip on the kite throughout the bar release and until the kite is depowered. 1. 1. Grab leashes or any other leash that isn't attached to the rider is dangerously unreliable. 2. 2. Grab leashes are not an acceptably safe alternative to a properly secured leash system. 3. 3. ALL kiteboarders need to give other riders assistance at all times. Access to this and other launches could be sacrificed, people injured and gear damaged through indifference to this essential courtesy. Helping other riders needs to be second nature and without delay. Many incidents have happened in the period of waiting when the rider is close to hard objects. Grab leashes have come into favor by some experienced riders and even some pro's as alternative to going out without any leash whatsoever. If everything goes well grab leashes should work acceptably. Then again, if everything goes well, particularly for an experienced rider or pro they may never actually use a leash. The point is that things don't always go well. The KSI is full of stories where things have gone wrong in varying degrees of severity with a variety of unexpected injuries coming out of it. All riders need to wear reliable, well maintained and tested leashes. Past secured leash designs may interfere with some riders technique and tricks. Given new leash designs hopefully these excuses are no longer valid or soon will be. Lack of kite leash use is putting public safety and kiteboarder access at risk. If you injure someone or their property and aren't using a leash you may be in at a serious legal disadvantage legally and may take a major hit in terms of liability. There is NO ACCEPTABLE EXCUSE to ride without a proper leash in populated areas. Lack of leash use may have contributed to a recent pro rider fatality. In summary, grab leashes are insufficiently reliable and are not an acceptable alternative to a proper kite leash system. The rider indicated that three pro riders have released runaway kites at this launch in the last month under similar circumstances. Apparently structures upwind on shore create a zone of dirty, gust air over this riding area routinely. We really need to pull together more as a community in kiteboarding. If you are the only one standing on a dock and a boat pulls up with one person onboard, most of us would offer to help with the lines without thought. The difference in kiteboarding is that people can be hurt while waiting or attempting a solo landing. So, if you see someone coming in to land, imagine them getting lofted into rocks or trees unless you hurry up pronto to help out. Hopefully you will be given the same treatment. If not, those images may sometimes become reality and it would be a shame for your indifference to have contributed to the accident. This incident occurred in a part of New Zealand with abundant narrow beaches often bordered by dangerous obstacles (roads, power lines, buildings) and the wind is nearly always gusty due to the proximity of several mountain ranges in the area. The wind coming off the mountains forms rotor or turbulent cascading wind that creates highly gusty wind conditions. Kiteboarding, as with any type of flying in rotor conditions, can be very challenging and potentially dangerous. A well experienced kiteboarder was out with a Cabrinha 15.5 m inflatable kite in 10 kt. onshore winds and was riding into shore to change to a larger board as the wind was dropping and he was going on and off plane. As he was walking in across the beach with his kite at a 45 degree angle above the ground, he was hit by a 16 to 20 kt. gust, possibly up to 25 kts over the dunes. No squalls were evident and such gusty conditions are relatively common in the area. He was dragged about 30 m (100 ft.), inland into the area where other riders were rigging up. Two people grabbed him and tried to anchor him in place. Although he tried, he couldn't unhook from the chicken loop. The rider was consciously keeping the kite low to the ground to avoid being lofted. He was wrenched free of the people that were trying to hold him in place by another gust. One bystander though he was going to be slammed at speed into the dune but the rider continued to gain altitude, cleared the 4 m (15 ft.) high sand dunes and disappeared behind them. He subsequently flew over the car park and was fully expecting to clear the house and road behind the dunes. Bystanders estimated that he was lofted to a height of about 9 m (30 ft.) and his overall horizontal distance of travel was about 60 m (200 ft.), through the air. He managed to control the kite and land just in front of a house, unhook from the chicken loop and let go of the bar to depower the kite. At this point the kite leash ripped off of his wrist. After flying another 50 m (170 ft.), the kite dived violently and landed leading edge down missing a moving car by 2-3 ft. A split second laterthe bar crashed into the power pylon sending sparks everywhere and the leaving the kite fully powered leading edge down in the road. Luckily it blew to the side of the road and didn't move to much after that. The rider about traveled about 60-80 m (200 to 270 ft.). The kite flew about 150 m (500 ft) overall. They ended up with 3 police cars and a guy from the electricity company to unhook the bar from the power lines, while the kite lay fully inflated and potentially powered up by the side of the road. The rider injured his knee and expects to have a month of rehab before he can kiteboard again. 1. 1. The rider concluded that he should have released the kite while he was being dragged down the beach while it was still possible. 2. 2. It is good that this rider practiced anti-lofting techniques by keeping his kite low. However in the face of overpowering gusts as in the case of 32. Incident# 3 3 02 or uplift from vertical surfaces such as the dunes, this technique may not help. Please see "How to try to avoid lofting" at the same location as this resource for more information on these techniques. 3. Riders in Wellington are faced with kiteboarding in frequent gusty, rotor wind conditions but there is a limit for safe kiteboarding. A change in wind direction was predicted that would cause the wind to pass over an offshore island contributing to rotor conditions. Local knowledge is a must in such areas and given the challenging wind conditions decisions on whether to fly or come in should be conservatively made by persons with adequate experience. These conditions are definitely not suitable for new kiteboarders. 3. 4. NEVER fly your kite upwind and near vertical surfaces that can cause uplift lofting such as hills, walls, buildings, dense trees, etc. 4. 5. Don't wait until you are close to danger, release your control bar earlier than later. Many accounts are described in the KSI where riders couldn't unhook from the chicken loop. Use of a quick release loop seems to be indicated and/or using a snap shackle. It is important to release the chicken loop sooner than later as there may not be sufficient time after the gust hits to react. 5. 6. Always use a kite good, well-maintained kite-depowering leash. This rider indicated the he is going to stop using wrist cuff leashes and go to one that is attached to his harness by a snap shackle. He had a wrist cuff pull off his hand once before. There is growing evidence that some leashes will fail if hit by the load of a well powered kite. This may be intended by the manufacturers to avoid breaking bones or dragging the rider. In theory, if the leash fully depowers the kite, quickly, the load that is imparted on the rider should be of short duration and hopefully manageable. The alternative of sending an out of control runaway kite downwind is unacceptable in many areas. The alternatives include not riding in such powered or potentially powered conditions or modifying the leash to be more resilient to loading. 6. 7. Always wear good safety gear including a helmet, impact vest, gloves and a whistle at a minimum. 7. 8. This rider was wearing an impact vest and a harness with a handle. The impact vest covered up the handle blocking access to it by the two riders that tried to assist. An exposed handle may have allowed them to maintain a hold on the rider. It would be good for manufacturers to produce an impact vest for kiteboarding that also permitted full use of a variety of purpose built harnesses. This was a significant lofting incident and could have resulted in serious injuries. A month off of the water is nothing to take lightly however. Riders should avoid gusty onshore conditions particularly when upwind of vertical surfaces. If riders have little choice in riding in such conditions it would be best to be very conservative in terms skill, techniques and safety gear. Local knowledge is critical before kiteboarding in such conditions and then only if you are properly equipped and conditions are well within your experience. When things go wrong, having a few of these factors on your side can make all the difference if luck isn't on your side. Several lessons have been repeated through several of the incidents in the KSI including using a quick release loop and/or snap shackle, have a good, well maintained leash that has been physically tested with the size kite you are flying under controlled conditions. Rehearse reacting to emergency scenarios frequently, test your gear to improve the odds of a rapid, correct response. Finally, wearing suitable safety gear such as a good helmet, impact vest, cut resistant gloves, hook knife, whistle and boots can reduce or eliminate injuries. A kiteboarder was riding Naish ARX 7.5 m inflatable four line kite in average 30 mph side onshore winds with gusts and lulls. He was about 50 m offshore when the wind dropped to 20 mph and threatened to stall his kite. He proceeded to take off his wakeboard to come in. He was suddenly hit by a strong gust, estimated at 35 mph and was lofted 15 ft. or higher. He was flown at speed horizontally a distance of about 40 m. He tried to unhook from the chicken loop but couldn't. He landed about 5 m from shore and was dragged up on to the beach on his back with his foot caught in one of his footstraps. He eventually managed to unhook despite being worked by waves, released his kite and activated his depowering leash. The rider was wearing a helmet. He was uninjured in this incident. 1. 1. Allow an adequate downwind buffer zone when riding, launching and landing. 2. 2. Using a quick release loop and/or snap shackle could help manage the unhooking problem. 3. 3. It is important to wear safety equipment. This rider credited reading the KSI and "How to Try to Avoid Lofting" as helping out in this incident. He decided to take off his board 50 m from shore to allow a buffer zone as a consequence of reading these materials. Add in his wearing a helmet and this rider is definitely trying to learn from the negative experiences of others. Use of a quick release loop and/or snap shackle may have reduced the duration of this incident and would be a good idea for all riders to consider using. Flying is weather as gusty of this always increases the level of risk and skill demands on the rider. Riders should think carefully about whether they are up to this unstable conditions in terms of experience and energy before going out. A new kiteboarder was just going to launch a Naish AR5 9.5 m inflatable four line kite in 15 to 20 mph winds. His girlfriend offered to give him an assisted launch. The rider went over the correct way to hold and launch the kite. The girlfriend apparently misunderstood the proper procedure as she proceeded to walk downwind towards the center of the wind window. The rider yelled at her to just put the kite down. A gust came up and started to launch the kite from her hands. The rider then released his bar to activate his depower leash. The girlfriend suffered line burns on her arm and leg. 1. Never have inexperienced people assist you with launching or landing kites. Fortunately, no serious injury came about in this incident only a lesson. There are many stories of miscommunication, premature kite launch and the like that have resulted in accidents. It is best to have few, very clear signals for holding, launching and landing kites with trained assistants. I recently had an experience when my girlfriend went to catch my kite. She has been helping me land kites for over two years. She apparently didn't look like she knew what she was doing to two bystanders who jumped in and promptly managed to relaunch my kite. One of the bystanders actually was hanging on to all four lines. So, make sure your assistant is prepared to tell bystanders in no uncertain terms loudly if necessary to please stay away, they might lose fingers if they try to help. Two riders of unidentified skill level had rented some kiteboarding gear and attempted to set it up. They attempted to rig a 10 m Wipika Freeair in 10 to 20 kts. gusting to 25 kts. sideshore. They rigged the kite incorrectly and sought out some assistance. One of the beach attendants of the kiteboarding business rerigged one side of the kite but was then called away to take a board to a student. He asked the two riders to wait until his return before rerigging the kite further. The two riders ignored this request and launched the kite. The kite rapidly looped twice in the power zone and lofted the rider through two shade structures, a surfboard sign and into some concrete stairs and a rock wall. The rider was wearing an impact vest and helmet. His helmet left green paint on both the stairs and the rock wall. He was hospitalized for two days, had multiple stitches and some memory loss. Immediately after the accident the rider had no idea that he was in the Dominican Republic or that he had been setting up for kiteboarding. 1. Never ride in conditions or with equipment beyond your level of skill or experience. 1. 2. If you are not totally sure that you have rigged your kite correctly and have thoroughly checked by someone who knows your system very well. 2. 3. Always carefully preflight your gear. Refer to the Safe Kiteboarding Guidelines in the section that contains this document for one preflighting procedure. 3. 4. Always wear a good helmet and impact vest. This was a serious, avoidable accident. If logical preflighting procedures or the instructions of the attendant were followed this accident never would have happened. It is very fortunate that the rider was wearing safety equipment. The outcome could have been far more serious if he had not been properly equipped. Safety gear such as helmets are worn in many activities routinely such as motorcycle and bicycle riding, and hang gliding. Helmets are not worn because they are needed routinely in these activities, far from it. Many people in these activities never actually need a helmet during an accident through their entire lifetime. They wear helmets to deal with sudden, rare accidents in an attempt to reduce injury or to aid in survival. The rider in this account was very lucky to have been wearing a helmet. It is unfortunate that he is in the vast minority of riders in choosing to take this simple precaution, at this time. Winds were SW 15 to 20 kts. As a rider self-launched his Naish 21 m ARX kite he realized that one of his flight lines had been made significantly shorter by a tangled stick. The kite rapidly flew up into the center of the power zone dragging the rider at high speed over several hundred feet. The rider barely missed two metal sign poles, a truck and finally was dragged into a wooden fence. The old and weakened fence yielded on impact. The rider forced his kite down by crashing it into a parking lot on top of windsurfers and beach goers. The rider walked away without reported injury. 1. 1. Assisted launching is always preferred and particularly when flying in overpowered conditions. 2. 2. It is much easier to look down your lines for problems with assisted launches than with solo launches. 3. 3. If you must solo launch, carefully walk down your lines, several times during preflighting in higher winds. 4. 4. A snap shackle or safety harness line might have made getting free of the kite easier or feasible. 5. 5. A helmet and impact vest may have reduced injuries if the rider connected with hard objects over the several hundred feet distance of the dragging. Careful preflighting would have avoided this accident. When rigging for overpowered conditions become even more careful and methodical than normal. In such conditions the rider must accept a higher likelihood of things going wrong with possible injuries resulting. If you attach yourself to the kite near hard objects you must accept the possibility of being dragged into them if things go wrong. Winds were S 10 kts. A rider was about to do an assisted launch of his Wipika 11.5 m kite. The helper had just attached the lines to the rider's kite. This was a test flight to check out a new control bar system. The helper picked up the kite and walked out until the kite loaded up with wind. He then released the kite without any signal from or to the kiteboarder. The rider quickly realized that his lines had been attached to the kite incorrectly. He was then dragged for 10 to 15 ft at which point he was able to depower the kite. No injuries or kite damage were reported. 1. 1. Always attach your kite lines yourself. If for some reason you don't do this personally take the time to carefully preflight the lines and other gear yourself. 2. 2. Never have inexperienced people do assisted launches or landings for you. 3. 3. Agree on simple hand and/or verbal signals to coordinate launch and landings. Make sure your assistant is very clear on these signals and under no circumstances will release the kite until properly signaled. Make a set preflight procedure and stick to it, always, just like pilots do. Talk carefully with your assistant about procedures before launching or landing. This was a minor incident but in powered conditions the outcome could have been much more serious. A 155 lb. (70 kg) kiteboarding instructor of about 2 1/2 years experience on a four-month holiday in Cabarete was rigged with an RRD 11.9 m kite. The wind had been consistently side shore 10 to 15 kts. He noticed a black line of clouds or squall moving in to shore. He came into shore at the west section of Cabarete Bay at Bozo Beach. He lowered his kite to within 3 to 5 m (10 to 16 ft.), off the ground for an assisted landing. He was then hit by a violent wind gust, that he described as an “explosion.” Wind records from nearby wind meters reported that average winds were 35 kts. with gusts up to 51 kts. The winds had shifted suddenly from side shore to dead onshore. By the time the rider understood what happened he was flying inland over a building under construction with exposed rebar at an altitude of approximately 20 m (65 ft.). He didn’t feel it was safe to pop his snap shackle release at this point. He continued to rise in the gust and at one point estimated his altitude to be 30 m (98 ft.) or higher. Looking forward he saw no clear area to land but was rapidly flying towards high tension lines and trees. He noticed a pine tree and headed in that direction. He described the kite handling to be stable but very “twitchy” with attempted control inputs. He had a few previous experiences hang gliding and paragliding and felt this time at least helped him manage the shock of the flight in part. He was traveling at approximately wind speed or roughly 40 to 45 kts. over ground. He then hit the pine tree, breaking a limb and then rebounded into the trunk. He then fell down through the tree breaking limbs until he hit the ground. His kite then started to power-up again. At this point he released the snap shackle and his kite flew off to windward where it was heavily damaged. The rider was admitted to the hospital for observation for possible signs of internal organ injury and brain hemorrhaging. He was released two days later and returned to kiteboarding two days after that. He was not wearing a helmet but was wearing an impact vest. The overall horizontal distance traveled was reported to be 250 m (822 ft.). 1. 1. If a storm, black clouds or squall line is moving in, get off the water well in advance of the storm and while conditions are still stable and unchanged. Always be aware of weather conditions while you are kiteboarding and be prepared to act quickly if conditions change for the worse. Your kite should be down on the beach and thoroughly anchored well before any change in wind speed or direction or air temperature occurs. At a minimum it would also be a good idea to remove both lines from one side of the kite in case it is swept up in gusts. 2. 2. If you suspect storms may be in the area, check out color weather radar if available in your area. If strong storm cells are moving towards your area, don’t go kiteboarding. 3. 3. Don’t assume that the current wind direction and speed will persist if a storm hits as it may change both direction and speed violently several times. c) to have held the control bar while near the shore and landing. When the gust hit, the bar would have been ripped out of his hands. This approach is different than what most riders currently do. It has recently been suggested as a potentially safer means of managing the kite while near hard object during launch and landings while on or near shore. 5. Always wear safety gear including a good helmet, impact vest, gloves and hook knife at a minimum. This rider was incredibly lucky to have come through a flight about 100 ft. in height, over a horizontal distance of over 800 ft. moving at a speed over ground estimated to be on the order of 50 mph, alive and largely uninjured. The boost in wind speed from 15 kts. to over 50 kts. equates to over ten times the lifting kite power. So if 15 kts. could easily lift this 70 kg. rider, the reality of what 50 kts. could do is astonishing. This rider was lofted by another squall in Europe almost two years ago into a rough landing on the beach. Another rider at Kitebeach in Cabarete reportedly was lofted into a palm tree and was left hanging on to the tree when he lost his kite. Three other kiteboarders lost their kites, which ended up hanging in two trees and one power line. I was told that no white caps or other surface disturbance signs were noted in advance of the storm cloud. Those that were looking for changing sea conditions and thought "no strong wind was coming", were sadly proved to be very wrong in this case. Finally, on a very serious note, two girls were admitted to the hospital at the same time as this rider. They had been out parasailing off Puerto Plata about 15 miles to the west when the squall hit. One girl was killed and the other paralyzed. Violent squall winds are a serious hazard to more than just kiteboarders. The conventional wisdom on how to avoid lofting is to keep your kite low while near hard objects. Apparently in this case either the very high wind speed and/or perhaps inadvertent control bar inputs sent the kite flying up from the ground fully into the power zone. Normally it is expected that violent dragging would occur. Not in this case. Dragging could have easily caused serious injury or death considering the wind speed and associated kite force. Logic dictates that the only proper, reasonably safe way to deal with this situation would be to never be in it in the first place. If squalls are coming, land your kite very soon. Squalls of this level of violence are reportedly rare in Cabarete. They do occur with some regularity in Florida, particularly during the warmer months. They may also be reasonably common in many other parts of the world. If you see a squall coming in, you have no idea whether the wind will die, reverse, boost 5 kts. or 50 kts. or all of the above. I am reminded of a story about Luftwaffe glider pilots trying to learn about conditions inside cumulonimbus storm clouds just prior to WWII. Of the original group of 35 pilots I recall that two survived interacting with the incredible violence inside these clouds. Some things are best left alone. Other kiteboarders have been injured by squall winds in several other accounts in this section. Black incoming storm clouds and squalls should be avoided by kiteboarders at all costs. Summary: A kiteboarding instructor and professional kiteboarding competitor with very extensive experience had just completed giving a lesson. He rigged up an Airblast 11.8 m with the steering lines 6 inches shorter than the backlines. The wind was side offshore at 20 mph reportedly.